As in the traditional Japanese martial arts, the robots try to push the competitor off the ring. A match is fought between two teams, each team having one or more members. Only two team members from each team may approach the ring. The operator and the assistant will enter the game area, the other team members must watch from the audience. In accordance with the game rules (hereafter referred to as "these rules") each team competes on a Dohyo (sumo ring) with a robot that they have constructed themselves to the specifications in Section 2. The match starts at the judge's command and continuous until a contestant earns two Yuhkoh points. The judge determines the winner of the match. After the match the operator and the assistant will go to the assigned room for the challenge and wait there for the next game. A. Any robot design is allowed, if is not subject to the limitations of section 2.2. B. A robot must fit within a cube with the side length of 2.5 cm (25mm). C. The total mass of a robot at the start of a match must be under 50g. D. A robot may expand in size after a match begins, but must not physically separate into pieces, and must remain a single centralized robot. The robot’s feet must not expand during the match. Robots violating these restrictions shall lose the match. Screws, screw nuts, washers and other robot parts with a total mass of less than 5 g falling off from a robot's body, shall not cause the loss of match. F. The robots must have displayed a number, offer by the organizers, on the outer casing of the robot in a visible place. The number it is used to identify the robot by the referee and can be found in the Team's Folder (details in appendix 2). A. For safety reasons the robot must be equipped with an IR kill switch to be operated by the judge. When the judge sends a kill signal the power to the motors shall be shut down. The robot builder is responsible for adding such a kill switch on the robot. The technical specifications for the IR receiver are given in the appendix 1. Contestants can either implement their on hardware or use a prebuilt module offered by the organizers. This module can supply the signal for activating the kill switch. It is mandatory that the IR start module to function and the responsibility for is entirely of the team. If the module is not on the robot or is not working the team will be disqualified from the competition. If a problem occurs with the module during a fight it is recommended and allowed to be replaced. During the homologation and in the matches the module must function properly. B. Jamming devices, such as IR LEDs intended to saturate the opponents IR sensors, are not allowed. C. Parts that could break or damage the ring are not allowed. Do not use parts that are intended to damage the opponent’s robot or it's operator. Normal pushes and bangs are not considered intent to damage. D. Devices that can store liquid, powder, gas or other substances for throwing at the opponent are not allowed. E. Any flaming devices are not allowed. F. Devices that throw things at your opponent are not allowed. G. Sticky substances to improve traction are not allowed. Tires and other components of the robot in contact with the ring, must not be able to pick up and hold a standard A4 paper (80 g/m2) for more than two seconds. H. Devices to increase down force, such as a vacuum pumps and magnets are only allowed in the Mega sumo class. They are not allowed in Micro sumo class. I. The blade and the expansion of the robot can not be white. The dohyo interior is defined as the playing surface surrounded by and including the border line. Anywhere outside this area is called the dohyo exterior. A. The ring shall be circular made from wood with a thickness of 1.25 cm, painted in black with a diameter of 19.25 cm (192.5 mm). B. The border line is marked as a white circular ring with a width of 0.625 cm (6.25 mm). D. For all given dohyo dimensions a tolerance of 5% applies. There should be a space appropriate for the given class outside the outer edge of the ring. This space can be of any color, and can be of any material or shape as long as the basic concepts of these rules are not violated. This area, with the ring in the middle, is to be called the "ring area". A. One match shall consist of 3 rounds, within a total time of 3 minutes, unless extended by the judges. B. The team who wins two rounds or receives two "Yuhkoh" points first, within the time limit, shall win the match. A team receives a "Yuhkoh" point when they win a round. If the time limit is reached before one team can get two "Yuhkoh" points, and one of the teams has received one "Yuhkoh" point, the team with one "Yuhkoh" point shall win. C. When the match is not won by either team within the time limit, an extended match may be fought, during which the team who receives the first "Yuhkoh" point shall win. Alternatively, the winner/loser of the match may be decided by judges, by means of lots, or by a rematch. D. If the robots get stuck, the rules from the point 6.1 will be applied. E. If one of the two robots won’t start, a restart will be done. If at this restart the same robot won’t start, the match will be won by the robot that moves. Important!!! One person can be operator for maximum 2 robots. A. The robots will be divided into groups according to the number of participants. The competition will take place in a groups/quarters/semifinals/finals system in order to allow as many rounds of play for each robot. Each match is played on the best out of 3 rounds system and will be supervised by 3 refs (a principal one and two assistants), excepting the finals where the match is disputed on the 5 rounds system. The decisions of the refs must be unanimous and are final; questioning these decisions leads to disqualification. B. If two robots of the same team will advance to quarters/semifinals/finals and play one against the other, they must play the match, without demanding that one of them to advance without play, or to demand to arrange the matches or the opponents. C. The order of the robots in the groups will be made random, it will be made after the official opening of the competition, will be available on the website for all the participants. The ones that pass the groups will play quarter/semifinals/finals. If the number of the participants will not be enough for the groups the competition will be played from the beginning using the pyramidal system. The position in the pyramid will be random. D. During the whole contest, a team has the right at 2 reprogramming interruptions, 5 minute each. Other breaks are allowed only for mechanical problems and only with referee’s approval. This rule is applied only during a running match. Besides the matches, the changes and reprogramming are allowed. The teams are required to be at the start in maximum 1 minute from the request, otherwise they will lose the match. E. Until the homologation, all the teams will stay in the room reserved for them (the room will be marked in the area map from the team’s folder). Each challenge will have a room. The teams can leave the room only when they are called to the competition area. Each team will be called by a competition official, when they need to go to the waiting area which is near the competition area (details in appendix 1). F. After the homologation the teams, which will follow at start, will remain at the competition area, in the waiting area. The teams will leave this area only if the referee agrees, or only for repairs and they must return in the time set by the referee. If the team doesn’t return at the first call, they will lose the match. G. After a match is over, the teams must return in the room reserved for them. H. Each team has the responsibility to follow the starting grid (schedule), displayed on the website and in the team’s room. PLEASE DON’T BE LATE, WE WILL NOT WAIT!!! If you are called to play and you don't come in 5 minutes the robot is desqulified. I. Each team will have one operator and optional, one assistant. Only the operator and the assistant are allowed in the waiting area and in the game area. The rest of the team will remain in the room or will follow the game from the audience. Each team will have to pass the homologation stage, in order to participate with theirs robots in the competition. A. It will be checked if the number exists on the outer casing of the robot. B. A photo will be taken to every robot in which the numer will be visible. C. Checking the robot dimensions by placing a 2.6 cm x 2.6 cm (26mm x 26mm) box/frame, bottomless, over the robot. D. Weighing the robot on a digital scale. The maximum value must be 51g. E. Checking the operation of the IR sensor to start and stop the robot. A. Checking the robot dimensions by placing a 2.6 cm x 2.6 cm x 2.6 cm (26 mm x 26 mm x 26 mm) box/frame, bottomless, over the robot. B. Weighing the robot on a digital scale. The maximum value must be 51g. C. It will be checked if the number exists on the outer casing of the robot. After approval the first 4 teams will remain in the waiting area near the game area. The rest of the teams will return to the room assigned for them. Upon the judge's instructions, the two teams approach the ring to place their robots on the ring. The operators will place the robots in the same time on the ring. The Judge will give the signal. After placing, the robots may not be moved or touched anymore. Any part of the robots must be placed behind the Shikiri-Sen (staring lines). The robot shall not go over the starting line toward the oponent. The referee will check if the robots are places ok. If the placement is not corect, the robot positioning will be made again. In Mega, Mini and Micro classes the judge starts every round by sending a start signal with an IR transmitter. As soon as the robots receive the signal the round will start immediately, without any delay. The technical specifications for the IR receiver are given in the appendix. Contestants can either implement their own hardware or use a prebuilt module offered by the organizers. The start will be made after the operator and/or the assistant will be in the safe area.If the operator and/or the assistant will leave the safe without referee approval the team can lose a point or can be disqualified. The match stops and resumes when a judge announces so. The judge announces the moment when the robots can be placed on the ring, moment when the operator and/or the assistant to retreat in the safe area and the moment when they can take the robots from the ring. The match ends when the judge announces so. The two teams retrieve the robots from the ring area. After the robots are retrieved the decision is final and no objections shall be declared. One Match will be fought for a total of 3 minutes, starting and ending upon the judge's command. A. A team legally forces the body of the opposing robot to touch the space outside the ring. B. The opposing robot has touched the space outside the ring on its own. C. The opposing robot has left the ring surface completely, even if the other robot has touched first the space outside the ring (after a contact between the robots). D. The opposing robot gets damaged without being able to continue and the team’s representative announces it. 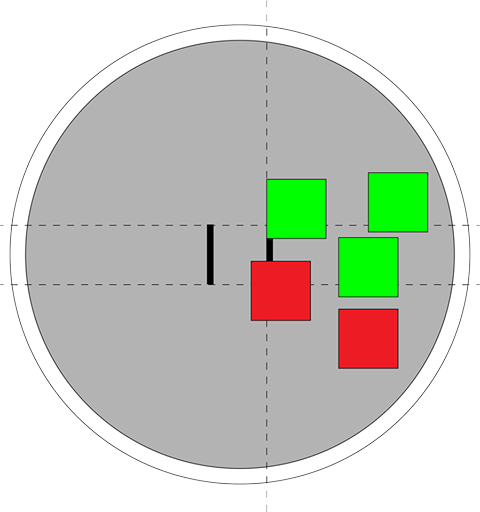 E. If both robots leave the ring at the same time, the robot that gets pushed outside will lose, even if the one that pushes touches first the space outside the ring. A. If one of the two robots doesn’t start there will be one restart. If at restart the same robot doesn’t start, the point will be won by the robot that moves. B. The robots are entangled or orbiting each other with no perceivable progress for 10 seconds there will be one restart. If at restart the situation is repeating, the winner will be the robot that moves more and shows the willing to fight. C. If one fast robot get stuck in a slow robot for more than 5 seconds, there will be one restart. If the progress is none or the robots move very slow, after 5 seconds the judge stops the match. The teams can't make any objection. If at restart the situation is repeating, the robot that moves faster and attack will be the winner of the round. D. If two fast robots get stuck for more than 5 seconds, there will be one restart. If at restart the situation is repeating, the robot that moves faster and attack more will be the winner of the round. E. If one robot has 1 point and in the next round there is no winner, there are allowed only 2 rematches. If in the 2 rematches allowed no one wins, the robot that has 1 point will be the winner of the match. F. Both robots move, without making progress, or stop (at the exact same time) and stay stopped for 5 seconds without touching each other. However, if one robot stops its movement first, after 5 seconds it will be declared as not having the will to fight. In this case the opponent shall receive a “Yuhkoh” point, even if the opponent also stops. If both robots are moving and it isn't clear if progress is being made or not, the judge can extend the time limit up to 30 seconds. G. If both robots touch the outside of the ring at about the same time, and it can not be determined which touched first, a rematch is called. In the case the winner can't be declared in any of the above situations, there will be a special rule:A bottle will be placed in the center of the Dohyo and the first rbots that touches it is declared the winner. If a robot gets broken during a match, the main referee will assign a repair within 1 minute. This range can be extended up to 5 minutes the organizers. The repairs will be supervised by an assistant referee, to avoid changing the robot modules with other unapproved ones. If a robot can not be repaired within the range specified, the match is won by the opponent robot, but the broken robot team can continue repairs until the next match involved, in this case being supervised by a referee / member of the organizing committee. Replace defective parts can be made and the batteries can be recharged during the competition, if necessary. Players performing any of the deeds described in Sections 2.2, 7.2 or 7.3 shall be declared in violation of these rules. A. A player who utters insulting words to the opponent or to the judges or puts voice devices in a robot to utter insulting words or writes insulting words on the body of a robot, or performs any insulting action, is in violation of these rules. B. It is considered serious misconduct when the operator and/or the assistant doesn’t retreat to the safe area or don’t comply the indications of the referee. C. It is considered serious misconduct if the start/stop module doesn’t work or is missing and the robot will be disqualified. a. A part of the player's body is in the ring. b. A player puts any mechanical kits into the ring to support his/her body. a. Demand to stop the match without appropriate reasons. b. Take more than 60 seconds before resuming the match, unless the judge announces a time extension. c. Does or says that which disgraces the fairness of the match. d. The operator and/or the assistant will leave the waiting area without announcing the official of the competition or the referee regarding the reason of leaving. If a team has 2 warnings, a ”Yuhkoh” point will be given to the opposite team, or the team can be disqualified depending of the gravity of the action that they did. A. Players who violate these rules by performing the deeds described in Sections 2.2, 7.2 and 7.3 shall lose the match. The judge shall give two Yuhkoh points to the opponent and order the violator to clear out. The violator is not honored with any rights. B. Each occasion of the violations described in Sections 7.3 shall be accumulated. Two of these violations shall give one Yuhkoh to the opponent. A. No objections shall be declared against the judges' decisions. B. The operator of a team can present objections to the Committee, before the match is over, if there are any doubts in the exercising of these rules. If there are no Committee members present, the objection can be presented to the judge before the match is over. As long as the concept and fundamentals of the rules are observed, these rules shall be flexible enough to encompass the changes in the number of players and of the contents of matches. Modifications or abolition of the rules can be made by the local event organizers as long as they are published prior to the event, and are consistently maintained throughout the event. A. Participating teams are always responsible for the safety of their robots and are liable for any accidents caused by their team members or their robots. B. The RoboChallenge organization and the organizing team members will never be held responsible nor liable for any incidents and / or accidents caused by participating teams or their equipment. Every round in Micro Sumo class is started by the referee sending a start signal with an IR transmitter. As soon as the robot receives the signal the round will start. (This method makes the matches fairer since it eliminates false starts and is also time saving since less restarts is needed). The contestant can choose to either implement all the hardware and software by them self or he/she can simply use a prebuilt module surcharge (recommended). The kill switch is used to cut power to the motors of the robot, this is used as a safety precaution and is only mandatory in the Mega Sumo class. When the referee sends the stop command the power to the motors has to be cut. The robot builder is responsible for adding such a kill switch on the robot by themselves, however the prebuilt module can supply the signal for activating the kill switch. The prebuilt module takes care of all communication and is very easy to implement. The robot only needs to wait for the start pin on the module to go high and then it should start. The module accepts supply voltage (VCC) 3.3 - 5V. The VCC GND Start has standard 2.54 mm pitch. The prebuilt module can be ordered from the organizer,surcharge, during the online registration. The figure below illustrates the modes of operation of the module. To be less sensitive to noise and disturbances the module will save its current state into a non - volatile memory and if it is resets it will return to the last known state. This means that each match will end with the referee sending the stop command. If the LED on the module is on before the referee has sent the start command it means that the module is in the “Started” state. Then the stop command has to be sent and the robot needs to restart for the module to go back to the “Power ON” state. To be able to run multiple matches next to each other each dohyo will have its own unique identifier. The prebuilt module can be re - programmed to listen for a new identifier. This is done by the referee by sending a special programming command which updates this identifier. Robots which use sensors that are based on IR technology with a 38 Khz transmitter modulation are encouraged to start their sensors after the start signal is received. This is to minimize the risk of disturbance. The module has an option of usage without the special remote control. On the back of the module are 2 large pads- Home and GND. If one attaches an 1 Kohm resistance between the two pads, the module will accept signal from a standard TV remote control (the remote control that uses RC - 5 coding and was developed by Philips, but there are many other companies that use the same protocol). Sony and Nec have their own protocol and the remote control will not work. The best way to test if the remote control works, is to test it with the module. Pressing the 1 button from the TV remote control will be START and 2 will be STOP. For answers to the most common questions regarding the start systems.